The latest research from neuroscience and psychotherapy has shown we can rewire the brain to facilitate trauma recovery. 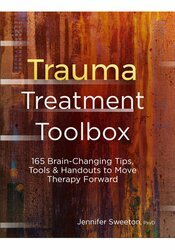 Trauma Treatment Toolbox teaches clinicians how to take that brain-based approach to trauma therapy, showing how to effectively heal clients’ brains with straightforward, easy-to-implement treatment techniques. Each tool includes a short list of post trauma symptoms, relevant research, application, and clinician tips on how to complete the exercise. Dr. Jennifer Sweeton PsyD, is a clinical psychologist, trauma and neuroscience expert, and workshop leader who has trained thousands of mental health professionals throughout the country and abroad. Dr Sweeton resides in the greater Kansas City area, where she owns a group private practice. "A marvelous conise yet comprehensive collection of tools for the trauma therapist. Dr. Sweeton describes the techniques in just the right level of detail to enable the reader to both deliver the intervention and provide a cogent, motivating rationale for its use. There's something in here to help every patient! I'll be consulting this creative volume for years to come." "This book is a tremendous resource for mental health providers and their clients. It is jam-packed with worksheets that lead readers through brain-based tools including focused breathing, awareness of body, movement, meditations and cognitive techniques. The meat consists of an extensive set of tools based on bottom up (using the body to change the brain) and top-down (using the reflective capabilities of the brain) approaches to brain change designed to help trauma survivors. An amazing book! Every therapist will want to use the tools in this book whether they specialize in trauma or not." "I love this book! With information and research for clinicians followed by protocols and scripts for each trauma tool, these top down (cognitive) approaches are very different than the usual thought challenging methods of CBT. I definitely will be adding this book to my current library and urge everyone working with these clients to do the same."